What is the most significant, ancient harbor city in Israel that hardly ever gets visited by tourists? 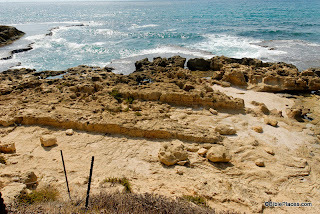 Everyone has heard of Caesarea, but that place is a young sprout compared to this site. Acco and Joppa are potential candidates, but even they get more publicity than this site. Continuing our series of "Obscure Sites in the PLBL" (or "What You Missed on Your Trip to the Holy Land") we focus this week on the small but significant site of Dor. 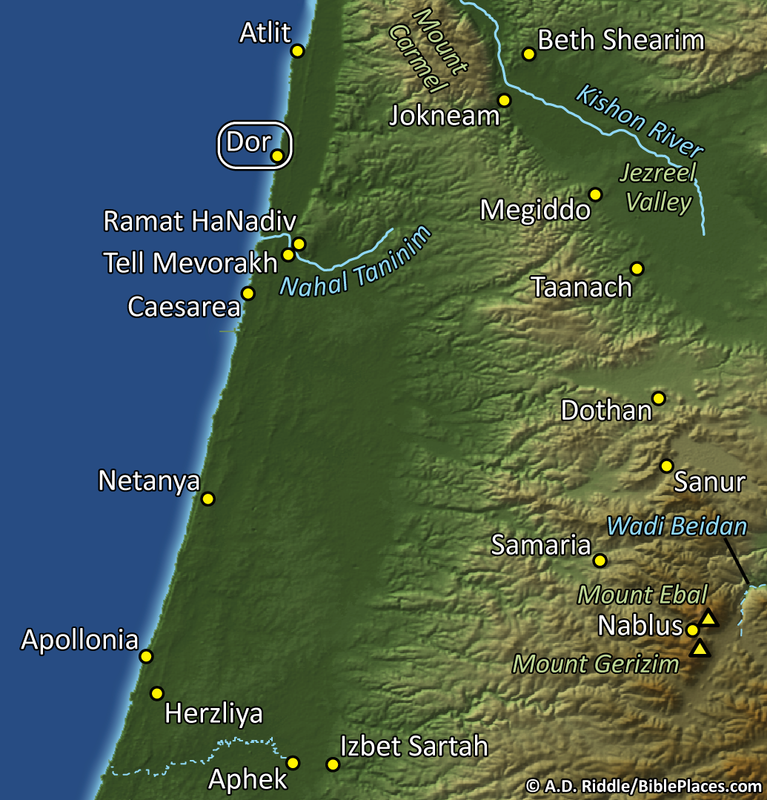 The map below is from the PowerPoint files included in Volume 2 of the Pictorial Library of Bible Lands. Dor is circled in the top left section of the map. 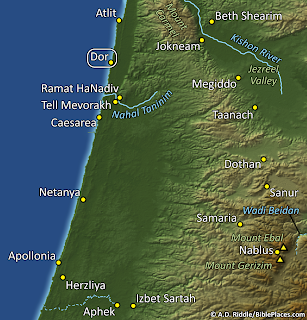 Tel Dor is located on the small Plain of Dor, which is nestled between Mount Carmel and the Mediterranean Sea. For a description of this small region, you can read a post I wrote on the Wild Olive Shoot blog here. In that post you will learn that this small strip of land in Israel's central region was more often controlled by foreigners than it was by Israelites. 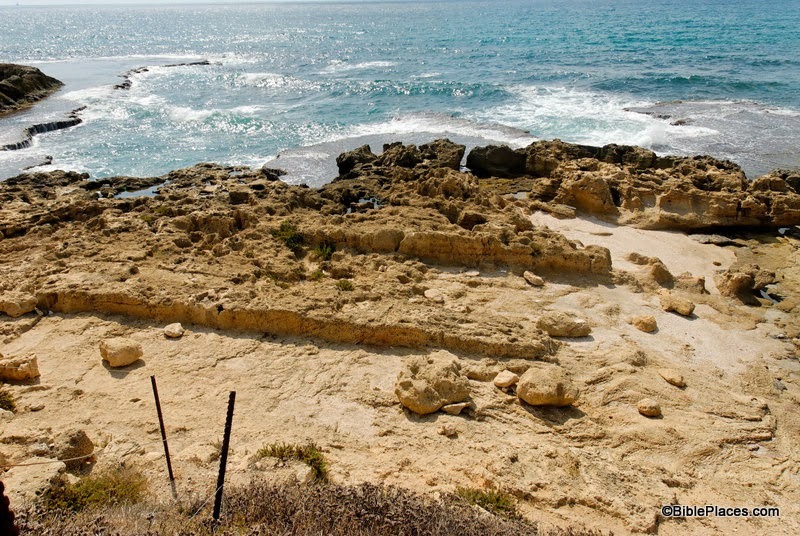 It served as a foothold into the region for Phoenicians and the Sea Peoples. In fact, in ancient times it was easier to get to this region by boat than it was by foot, due to the marshy terrain in the area. This brings us to the photo itself. Below you can see three boat slips used in ancient times by the inhabitants of Dor. The city was built right next to the sea which made it easy to haul boats in and out of the water. According to the excavators of Tel Dor, "The boat-slips are probably Hellenistic and/or Persian; they may have been dry-docks for fishing vessels, or berths for war-galleys." (Reference: http://dor.huji.ac.il/areaE.html.) According to the photo annotations included in the PLBL, you won't find boat slips like this at any other site on the eastern coast of the Mediterranean. So the next time you're in Israel, take a little time to explore this small (but significant) site. Archaeological remains from the time of Abraham to the period of the Crusaders have been found here. In addition to the boat slips, you will find the remains of a two-chambered gate from the Iron Age, two temples from the Roman Period, a purple dye factory used from the 1st to 6th centuries AD, a museum where you can see artifacts found in the area, and beautiful harbors where you can take a refreshing dip in the sea. This photo and over 1,200 others are available in Volume 2 of the Pictorial Library of Bible Lands, which can be purchased here for $39 (with free shipping). Aerial shots of Tel Dor are available here and here on Ferrell Jenkins's blog, and the Tel Dor excavation team has a very informative website at http://dor.huji.ac.il/. For more information on the region and additional photographs, see my post here.